Tree house for kids or/and adults? 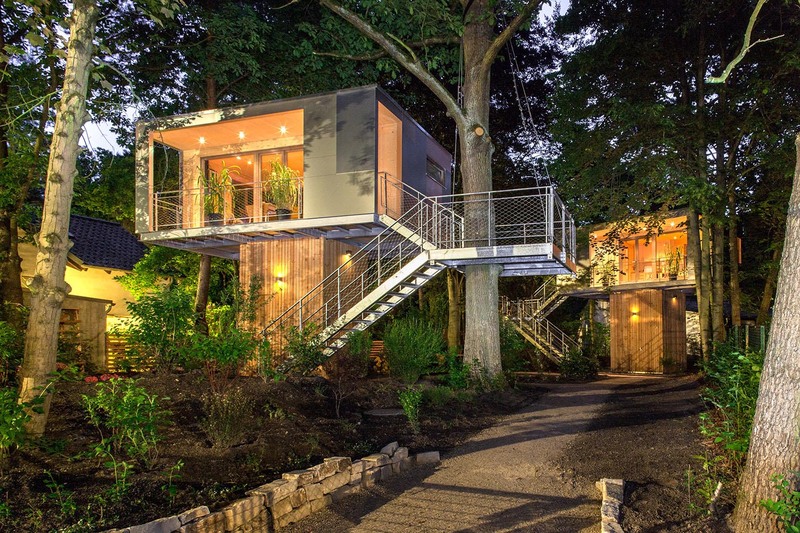 Tree houses are amazing if you want to have an additional space in your garden and spend some time there during first warm spring days and especially during summer. 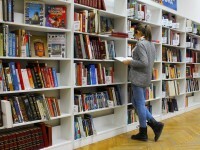 It can be a full-blown house with all utilities including electricity, water supply, gas and heating. It may have several rooms and even floors to fit and entire family. There’re even entire communities who build tree houses at one particular area, preferably near the forest or lake and live there instead of building or purchasing expensive capital houses or apartments. The idea behind that practice is that people are willing to live closer to nature and inside the houses, build out of the most natural materials. Besides, a tree house is significantly cheaper to build, although it’s necessary to figure out the ways to equip it with all necessary communications and find the right trees that might support a tree house of significant size. Such tree houses may be made as the guest houses or resting areas for big families. There’re also cases when parents build them for their grown-up kids for those times when they visit their parents with their own family. But, those tree houses require a throughout planning and a team of professionals, who’ve been engaged in building tree houses for a long time and know how to find a sturdy base to create an amazing eco-friendly house on trees, which will be as comfortable for people who live in them as an ordinary ground house. They are able to recreate the craziest designs and make those tree houses even better than normal homes, as they combine all the features of ground houses with the benefits of height and wood: the ability to choose the greatest view and build a raised veranda, add suspended walkways, use the most natural and less expensive materials and minimize the costs related to building a groundwork, etc. Professional carpenters will cope with wide range of tasks: from creating a veranda around the entire tree house, incorporating a spiral staircase to connect two stories, reusing the old wood of a sentimental value (like an old ladder) to building a backyard tree house for your kids to play in. However, you don’t have to carry out those massive projects and hire professional contractors or carpenters if you want to build a simple tree house for your little ones. 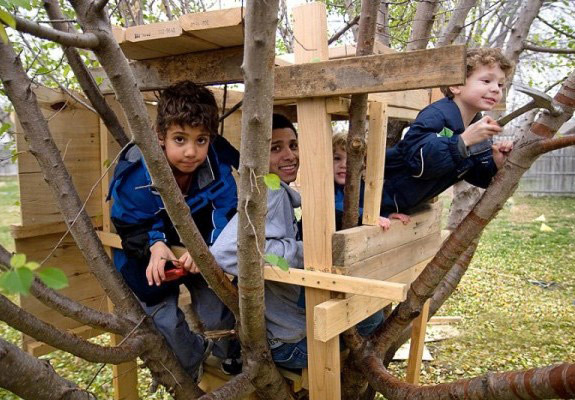 Yes, you’ll have to do your research to make sure that your tree house plan suits the tree you have in your backyard, so that the structure will be safe for kids to stay and play in. And, you’ll have to figure out the way to attach a platform to your tree, as it’s quite difficult to perform that part of the project without someone’s help. However, as you won’t have to install electricity and plumbing facilities inside the kid’s tree house and as it’s not nearly as heavy and spacious as a living tree house, it’s totally possible for you to build that fun play area for kids without hiring a contractor. Yes, it will take you several weekends to finish your DIY kids tree house, but the final result will be worth all your efforts. 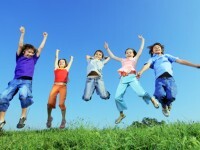 Your kids will not only enjoy playing in it, but also planning and building it with you. So, if you’re willing to give your kids such a nice present and make them play outside, start planning right away. And I’ll give you a general overview on how to build a tree house so that you’re able to learn the basic tree house construction techniques, determine the costs and performance time. That is the first rule of building a tree house, as the tree has to be strong enough to hold its weight. It also has to have quite broad crown with a couple of thick branches, so that you’re able to provide extra security and support for the walls. Besides, a perfect tree house tree has to have the roots that go deep into the ground and it shouldn’t suffer from any diseases or parasites, which might ruin its structure. Professional carpenters mention that oak, maple or apple trees are the best to build a tree house on. It’s important that the tree shouldn’t have any hollows and it should be living. Too old or too young ones won’t do the job as well. However, two or more sturdy trees that grow close enough to each other will be perfect. In general, a tree that fits the requirements listed above and has a trunk more than 12 inches in diameter will be able to hold a house, based on a square platform with 8 feet long sides. Check your local regulations for provisions that might forbid building a tree house within your area or on certain trees. Those could be the restrictions that limit the construction at a certain height or protect some rare or legacy trees. 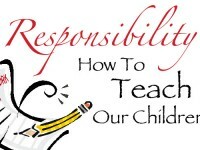 Do that beforehand, so that you don’t have to disappoint your kids and take the entire thing down when an inspection requires you to do so. Get a permit if that’s what your local regulation demand. Let your insurance company about your tree house building plans. The chances that they won’t be happy about your decision are quite high). You have to calculate the amount of wood you’ll need to purchase for a tree house of a certain size. Think about its height, roofing, deck, windows and doors too. 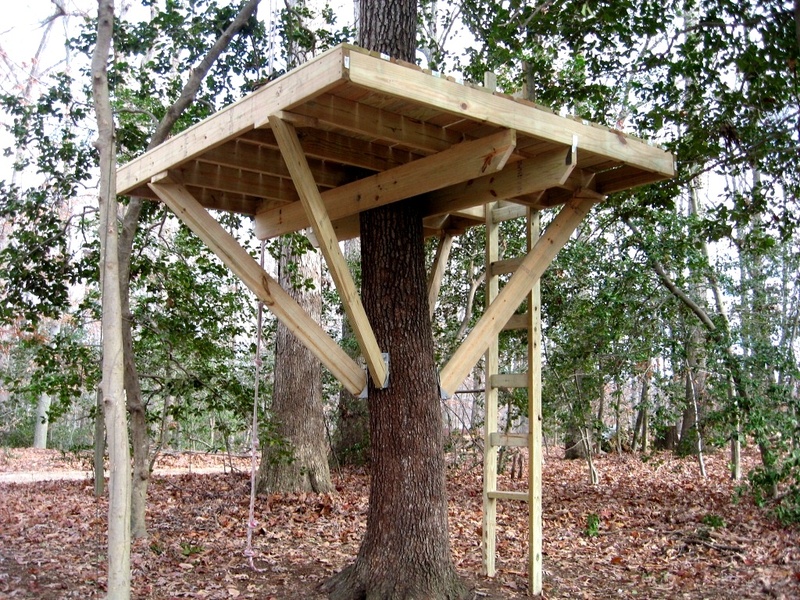 Don’t set up your tree house too high, as again, safety comes first. 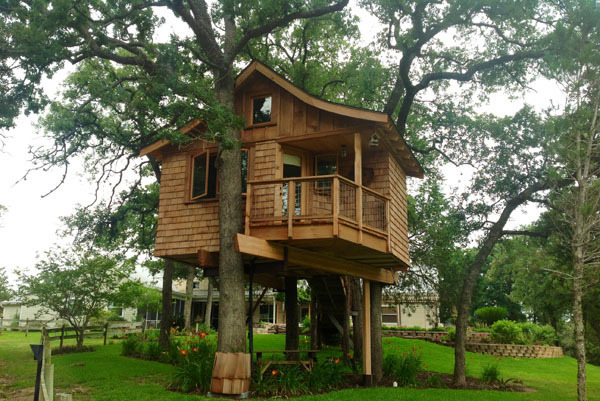 Surf the web to find a complete plan of a DIY tree house for children, as that will be the easiest option for beginners. If you don’t like any of the available plans, you may totally consider various pictures of tree houses and design your own plan along the lines of those you’ve already stumbled across while doing your research. 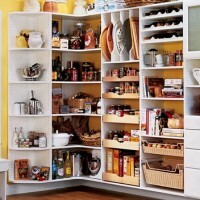 Don’t forget to include all measurements and estimated costs. Purchase enough wood (beams and planks). As it will be a kids’ tree house, you may totally reuse the old house doors and windows you’ve already replaced. 4. 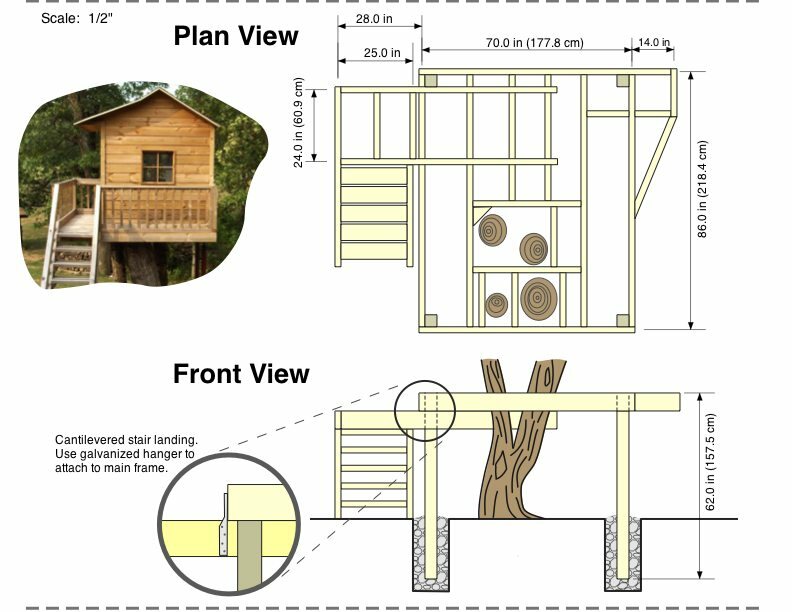 How to build a tree house? Build a sturdy platform first! This is the most important and the most crucial moment, which determines the success of the entire project and the safety of the future tree house. Also, it’s probably the most difficult step. There’re several methods of building a tree house platform: it may be either ground-based, or it may rest on the beams, attached to the tree. The second option is more traditional, so we’ll go with it. At first, you’ll have to find the place where the two stiff and thick branches of a tree are joined in a V-shape. Measure the distance between them, cut two wooden beams of the according length. They should be a little bit longer than the distance you’ve just measured. Secure those beams with long galvanized lag screws to each side of the two branches so that they are parallel to one another. Obviously, you’ll have to make the holes in the base beams of the platform beforehand, so adjust them to the tree to make the marks for the screws. Don’t forget to cut the slots on the beams to let the screws move as the tree grows in its diameter or when the wind shakes the branches. After that, place four other beams perpendicularly to the ones you’ve just installed. Make sure that the distances between them are even. Use deck screws to attach them to the base beams. Add two beams to connect both sides of those four ones you’ve secured in place before. This is how you build a frame for a tree house’s platform. Now, you have to provide extra support to your platform and ensure that it’s not wobbly whatsoever. So, secure each of those 4 beams to the base ones with the help of rafter tiles. Then, attach the bottom angled sides of several diagonal braces (you’ll need at least two, but it’s better to make four of them) to the lower part of the three’s trunk. Connect each brace to the corresponding side of the platform’s horizontal beams. If you decide to make four supporting braces, then two of then two of them will be conjoined at the bottom and attached to the same framing beam at the top (like on the picture above). Secure the overlapping places with the lag screws. At this point, you’re ready to install the decking. Once the hardest job is done, you may proceed to attaching the railing (to prevent kids from falling out accidents). Attach two columns to each corner of the platform and connect their tops with hand railing for that matter. Finish the railing according to your tree house plan. Install a rope ladder. Extent the railing columns with additional beams to create the roofing support. 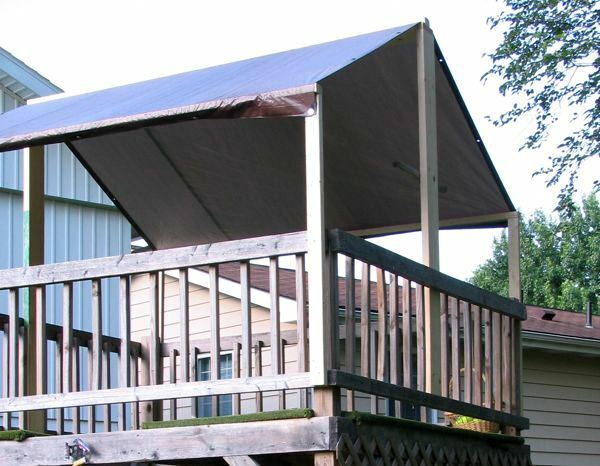 Attach the planks to them to create a pyramid (as on the picture below) and cover the roof with tarp and you’re done. However, you might build the walls of your tree house if your construction project and children presume their existence. You may build their base just as the railing and make the actual walls out of the out of the paticle board sheets. Although you’ll have to attach the vertical corner beams before nailing down the decking. 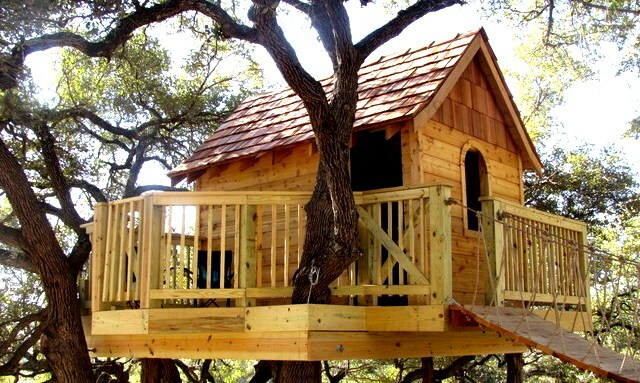 This is the kind of a guideline that shows how to build the simplest, yet quite entertaining tree house for your kids. Besides, those steps may be used to establish a base for pretty much any tree house. And I’m sure that any dad will be able to cope with this project in a short time. But if you’re aiming a more comprehensive design, I suggest that you should visit HireRush.com to hire an experienced carpenter to fulfill the most elaborate dreams of your little ones.